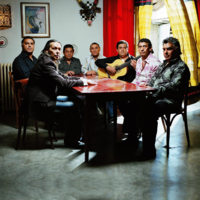 The Gipsy Kings are a group of musicians from Arles and Montpellier, France who perform in Spanish with accent from Andalucía. Although group members were born in France, their parents were mostly gitanos, Spanish Romani people who fled Catalonia during the 1930s Spanish Civil War, with the exception of Chico Bouchikhi who is of Moroccan and Algerian descent. They are known for bringing Rumba Catalana, a pop-oriented music distantly derived from traditional flamenco music, to worldwide audiences. Their music has a particular Rumba Flamenca style, with pop influences; many songs of the Gipsy Kings fit social dances, such as Salsa and Rumba. Their music has been described as a place where "Spanish flamenco and Romani rhapsody meet salsa funk".